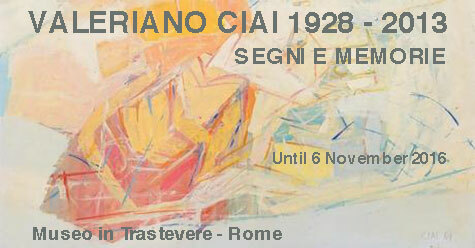 Ciai has been an innovative and influential presence in the artistic sphere of Rome for the past sixty years. The exhibit hosted at the Museo di Roma in Trastevere is presenting thirty works that document the artist’s entire career with the goal of drawing the attention of the city and the district in which he was born and lived for many years. Ciai was a gentle and reserved man who worked in quiet seclusion while participating in an important yet lesser explored movement related specifically to figurative art in Rome between the 1950s and 60s. After a phase of social realism painting, Ciai approached a form of “existential” realism which developed from a quasi-abstract style into a lyrical recollection of a reality presented in a dimension of imagination and memory.